France's prime minister will present plans today to crack down on rioters after a new flare-up of violence linked to the yellow vest protest movement. Rioters ransacked stores and restaurants while lighting fires along Paris's Champs Élysées avenue as they clashed with police. Cutting short a weekend ski trip, President Emmanuel Macron returned to Paris for a crisis meeting with ministers at which he ordered decisions to be taken rapidly "so this doesn't happen again". Prime Minister Édouard Philippe's office said the latest violence showed current security arrangements were "insufficient". Cleaners swept up broken glass, while shop owners boarded up smashed windows yesterday after the worst unrest in central Paris since violence peaked before Christmas in a weekly series of protests. 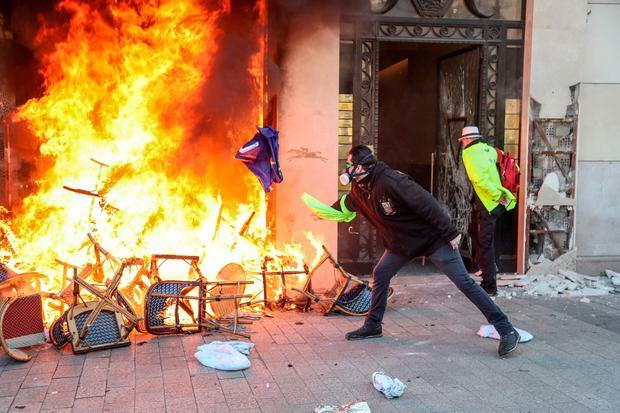 Rioters also set fire to an upmarket handbag store and badly damaged the famous brasserie Fouquet's.